Donation to Federici Conservation Project - Passaic County Historical Society ~ The History Girl! The Passaic County Historical Society is happy to announce that it is a step closer to achieving the goal of restoring its collection of original works by Paterson sculptor Gaetano Federici. At an assembly held at the Academy of Health Science (HARP) on February 11, 2015 Paterson art teacher Kathy Benevento made a donation to the project in the name of her (HARP) students. Benevento’s contribution will be used in conjunction with funds provided by the Passaic County Cultural and Heritage Council at Passaic County Community College (through a general operating support grant from the New Jersey Historical Commission, a division of the Department of State) to restore two small statuettes of Federici’s Nathan Barnert. 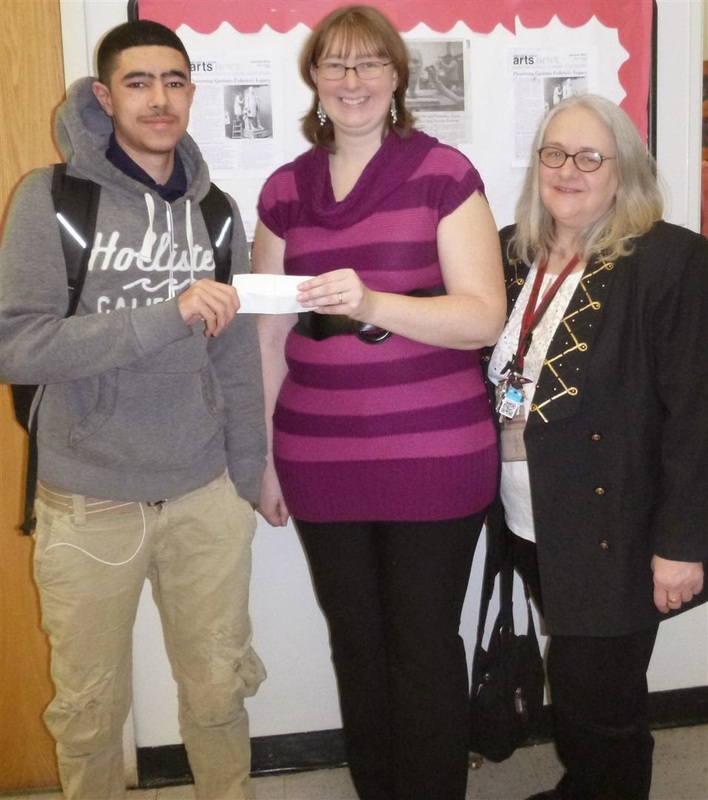 Teacher Kathy Benevento (right), with curator Heather Garside (center) and one of Benevento's students, Mahmoud Hammad. Photograph courtesy of the Passaic County Historical Society. Kathy Benevento, who has been teaching art in the Paterson district since 1999, first became interested in the project in 2013. She felt the project presented a means through which her students could learn about their local history and engage in their community. She explained, “After the presentation, my students shared their excitement for learning about Federici and his work. As one of my students remarked, ‘Wow, I walk past that statue every day.’” Benevento hopes that as an art educator, she will to increase her students’ awareness of the rich history of the city through art and increase students’ participation as community stakeholders. She also intends to work with the Society in the future to create a curriculum that will incorporate more about Federici and his artist techniques, so that her students can learn about history and art simultaneously. For more information about the Passaic County Historical Society’s Gaetano Federici Restoration and Exhibition project and to learn how you can become involved, visit www.lambertcastle.org/federici.html or call 973-247-0085.